This non-executive director's service agreement is a contract for services of a self-employed, part-time director. It takes clear no contract of employment. It can be used for a fixed term or a running contract for a company director, or director-level equivalent in a charity or other organisation. It provides particularly strong protection of company information. 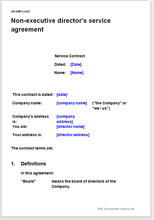 This is a service agreement that sets out the contract for services between a non-executive director and a company or other organisation. It should be used by any company or other organisation with a corporate structure which requires a contract with an independent non-executive director who will provide advice, balance and support. Being non-executive, the director is not an employee of the organisation. To preserve self-employed status it is important that the service agreement, as this one does, clarifies that the work of the director is in the nature of consultancy rather than executive employment. For example, the director is required to attend meetings and “bring independent judgement to bear on relevant issues”. This non-executive director's service contract is particularly strong on the protection of confidentiality and company secrets. The differentiation is important because as an employee, the director has greater rights and both parties are taxed differently. What matters in the judgement of whether the relationship is one of consultancy or employment is the nature of the work not the wording of the contract. However, as far as possible, this service agreement suggests the relationship is not one of employment.